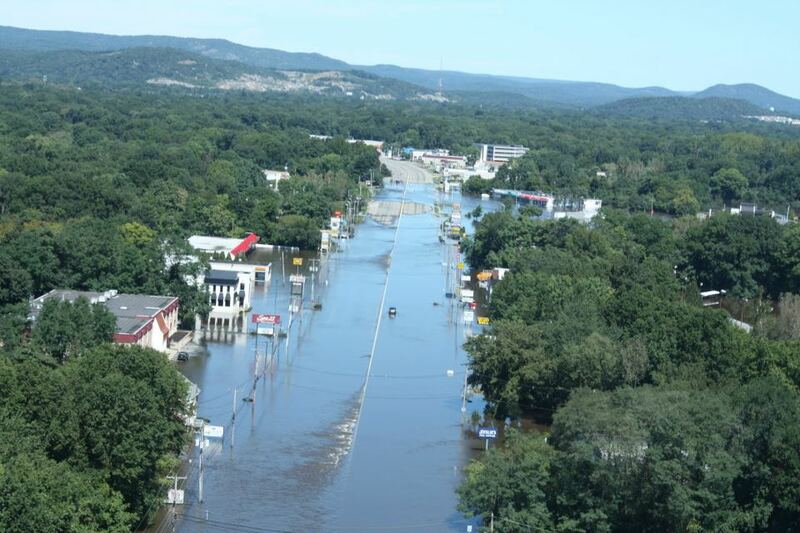 Many of us sat in disbelief just 2 months ago hearing that the threatening rainfall from Hurricane Irene was going to push the rivers to the limits and flooding was predicted to be worst than the 1984 Flood. It’s been a tough 2 months after the major flooding to our small close-knit community of just 14,500+ residents that live in Pequannock Township. 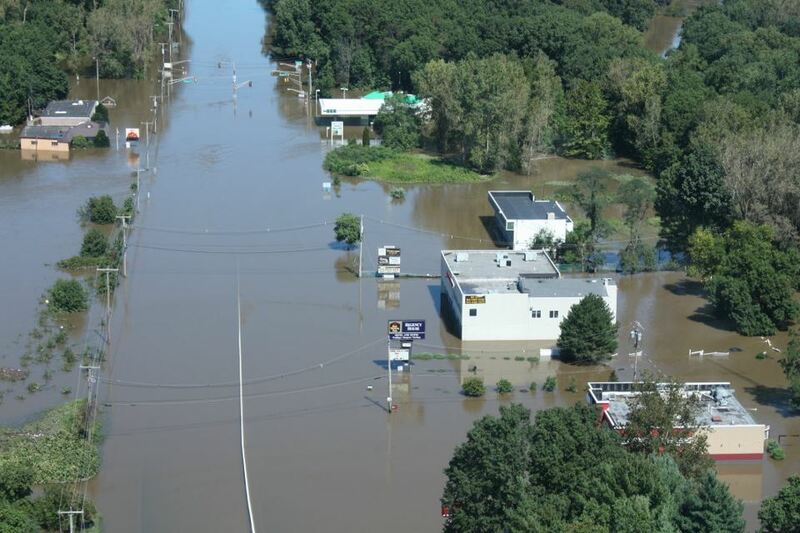 We all know families, friends, co-workers, teammates etc…that were affected by the flood waters that ravaged through our area starting with heavy rainfall on August 28, 2011 and finally the river cresting at an all time high of 25.24 ft. An estimated 1,100 homes in Pequannock Township were affected by the storm with 900 homes with major damage. The media hyped up that the Hurricane could have been a Cat 3, by the time it hit Virginia, Hurricane Irene was downgraded to a CAT 1 and was pounding her way to New Jersey, New York and the surrounding states. Finally belief, the Township did everything possible to alert the homeowners and business owners in the flood prone areas. 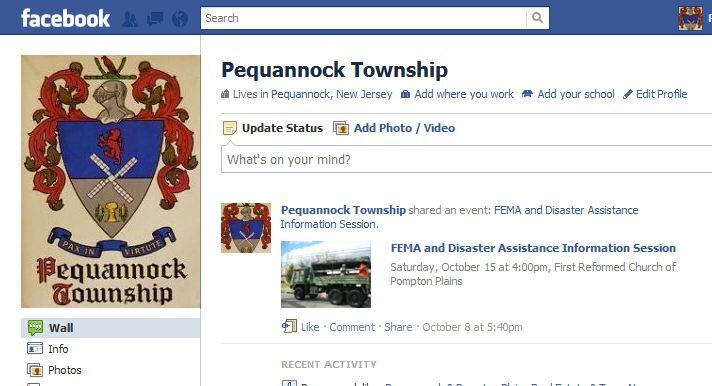 Door to door went the Fire Inspectors, Building Dept., Fire Departments, Reverse 911, Electronic Signs, Channel 77 News, the Township website was updated continuously during the storm (www.peqtwp.org), and social network, Facebook (https://www.facebook.com/#!/groups/226332979096/) was a great source of information for all. Yes, it turned out to be a Tropical Storm but in no way did Irene get out of Jersey without showing her true colors! 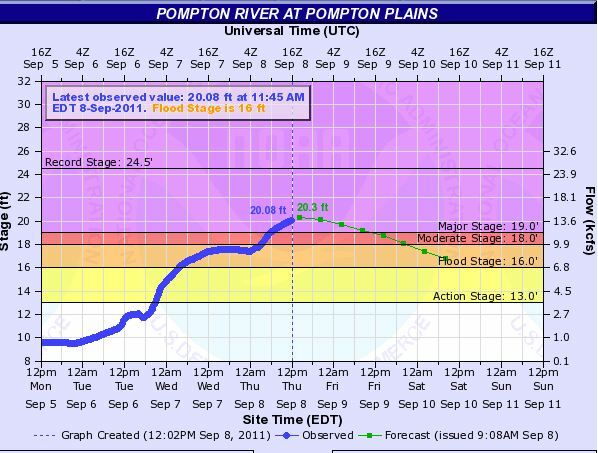 Many of us just waited it out, watched the Hydrograph on the NOAA site (http://water.weather.gov/ahps2/hydrograph.php?wfo=phi&gage=pppn4&view=1,1,1,1,1,1,1,1&toggles=10,7,8,2,9,15,6&type=2) and couldn’t believe how quickly the water was coming. That DAM many felt was the problem. They may be right but the amount of rainfall was just too much for any river, reservoir or stream to handle. I was actually watching the Town Council meeting from September and witnessed our own Township Attorney, Michael Hubner, who has lived in Pequannock Township most of his life said that he never speaks out in public with his personal opinions on such but he felt so strongly about how much he just LOVES this Town. He stated that he will do whatever he needs to do to help our Township. A large round of applause came from the audience. Now it’s 2 months after the Hurricane Irene, the rebuilding of the flooded homes in our township have been slow going. Homeowners are trying to get their children and families back in the HOMES that they LOVE. It’s been very difficult. The whole process going thru the ripping out. the cleanup, applications, waiting on the adjusters, FEMA etc… it’s just overwhelming. 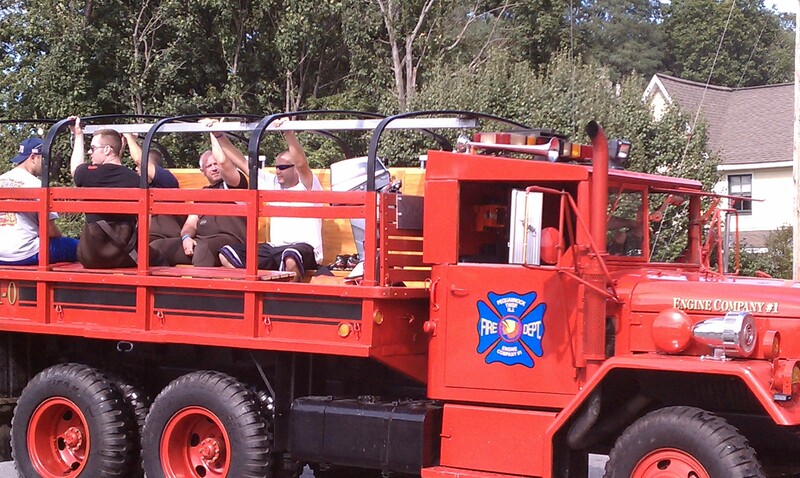 This recent disaster touched many, it brought our Township together even more. Town Employees, Council members, Local Churches, Organizations and Dedicated Volunteers worked shifts to care for families they never met before, they helped with preparing meals, laundry and so much more just proved what a “WONDERFUL TOWN WE LIVE IN”. As for the 900 homes in Pequannock Township that were damaged, some are living with no floors, furnaces, walls etc…but it’s their HOME a place that they LOVE! They will rebuild and be happy again, time will heal but it will never forget what happened. Something has to happen, we can not continue to go thru this every spring or even during unusual storms like Hurricane Irene. 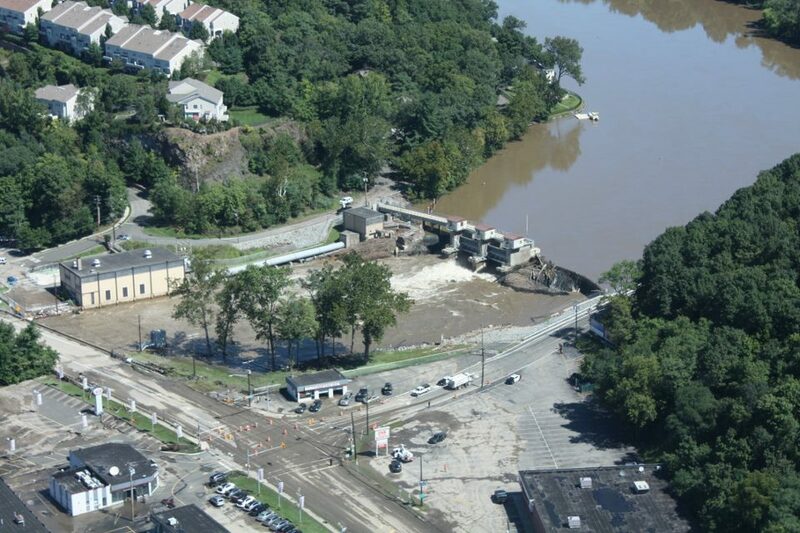 Pequannock Township is a STORM READY COMMUNITY but that doesn’t stop the river from rising, the DAM NEEDS TO BE ADDRESSED. The families affected need to know something is being done, not just talked about, debated about….they need to know that SOMETHING WILL BE DONE! Many know that my office was flooded and I recall my boss saying while we were pulling out furniture, “I’ll have it done in 2 months” well, today is 2 months and YES, it’s DONE!! Release Date: March 30, 2011 visit http://peqtwp.org/Cit-e-Access/news/index.cfm?NID=21809&TID=60&jump2=0 for a power point demonstration. Courtesy of Township of Pequannock. Gallery | This entry was posted in Uncategorized and tagged community, family, flooding, new jersey flooding, News. Bookmark the permalink.